How does the cell membrane achieve this complex function? How is it structured? Does it play any other roles? Let’s examine the cell membrane in more detail. The cell membrane serves a variety of functions. As previously mentioned, the cell membrane serves as a barrier which can open to allow certain needed substances into the cell while keeping other substances outside of the cell. However, the cell membrane also gives support and balance to cell, helping it maintain its shape. The cell membrane also serves as an anchor point for the cytoskeleton of the cell in some organisms, and it attaches to the cell wall in plant cells. The cell membrane also helps regulate the growth of the cell, by controlling the processes of exocytosis and endocytosis. Exocytosis has vesicles which contain lipids and proteins combine with the cell membrane, which has the effect of increasing the overall size of the cell. Endocytosis serves the opposite function, removing proteins and lipids from the cell membrane and bringing them into the interior of the cell, decreasing the size of the cell membrane and the cell itself. The cell membrane consists of a phospholipid bilayer. There are two layers made out of a variety of proteins and lipids. The individual phospholipids that make up a layer of the bilayer are composed out of a hydrophobic (water-avoiding) nonpolar fatty acid tail, while the head is a hydrophilic (water-loving) head made out of phosphate. These head and tail constructs make up the phospholipid and the phospholipids joined together in a single layer. One layer of the phospholipids faces another layer that is flipped so that the heads of both layers are on the outsides. The lipid and phosphate construction means that the heads of the phospholipids are attracted to water, while the tales repel water. This fact means that the bilayer is semipermeable and that only certain molecules are capable of diffusing across the bilayer. A component of the lipids in animal cells is cholesterol, which is dispersed in between the phospholipids and parts of the membrane. The cholesterol helps hold the cell membrane together and prevent the membrane from becoming too stiff by limiting how closely the lipids can be to one another. Cholesterol isn’t a part of the cell membrane in plant cells, only animal cells. Glycolipids are found on the surface of the cell membrane, and they have carbohydrate sugars attached to them. This enables the cell to differentiate the other cells of the body from foreign compounds or invading cells. There are different kinds of proteins associated with the cell membrane. Integral membrane proteins are those which are part of the membrane itself and are capable of passing through the membrane. The peripheral membrane proteins are only linked to the membrane through interactions with different proteins, they are exterior and not part of the membrane itself. Structural proteins enable our cells to maintain a constant shape and gives the cell support, much as the skeleton of an animal’s body does. Receptor proteins are those which enable the cell to communicate with things in the environment, achieving this to the use of neurotransmitters and hormones. Glycoproteins are proteins that have a carbohydrate chain linked to them, and they assist cells in communicating with other cells and transporting molecules across the cell membrane. Transport proteins, as the name implies, are responsible for transporting molecules through the cell membranes and into the body of the cell through the process of facilitated diffusion. Although the cell membrane is the most well-known membrane in a cell, some of the organelles found within a cell also have their own respective membranes. These membranes help protect the organelle from the other chemical functions going on in the cell, separating their components from the rest of the cell. Examples of organelles with their own membranes include vacuoles, lysosomes, and the Golgi apparatus. Vacuoles and lysosomes use a membrane to encase a variety of different substances for transport or, in the case of lysosome, elimination. The endoplasmic reticulum and the nucleus also have their own membranes. Some organelles even have more than one membrane, such as the mitochondria and the chloroplasts found within plant cells. Note that the membranes of the different membrane-bound organelles don’t all have the same molecular composition. 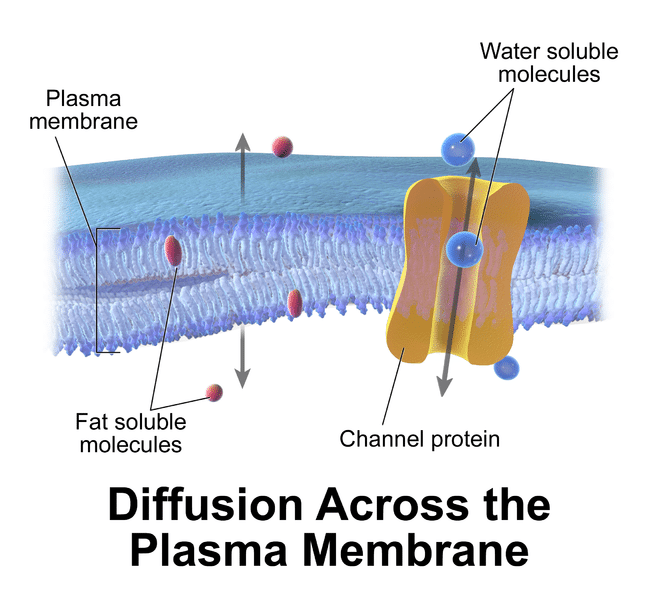 The composition of these various membranes depends on the role they must perform. Organelle membranes play important roles in functions like cellular respiration, the synthesis of proteins, and the production of lipids. The cell membrane isn’t the only part of the cell that plays an integral role in the cell’s survival and operation. The nucleus of the cell is often referred to as the cell’s brain and it controls the reproduction and growth of the cell. The nucleus has chromosomes within it which contain the DNA of the cell. The endoplasmic reticulum is involved in the creation of both lipids and carbohydrates. The Golgi apparatus is responsible for sending cellular products to the correct destinations, the ribosomes are involved in the creation of proteins, and the mitochondria are involved in the creation of the energy that the cell uses.